Good Morning Sunshine!!! are you ready to Wake Up with Zespri? Yuhuuu… Rise and Shine! here we were at first Zespri SunGold KiwiFest at Desa Parkcity. The fest was burst with positivity, healthy, fun, games, workout and of course Pop Pilates by Cassey Ho, famous female fitness YouTuber all the way from Los Angeles. Start my day with of positivity and healthy with the juicy and delicious Zespri SunGold kiwifruits. Oh by the way, do you like SunGold Kiwifruit? Oooo… I tell you once you tried it you will hooked on it. Recently, I kick start my hectic day with 2 Zespri SunGold Kiwifruit power packed with nutrients including Vitamin C, Vitamin E, fibre, actinidin enzyme, antioxidants and minerals such as potassium and folate which other fruits are unable to meet. 1 Zespri SunGold kiwifruit contain 3 times more Vitamin C than an orange, 10 times the nutrition of apples. In fact just 1 SunGold kiwifruit gives us 100% of our dailt Vitamin C needs. Good isn’t it? I feel that my bowel system has improved, keep me energetic and also the overall well-being. I love to eat it on its own, especially the ripe ones. It’s juicy, smooth and sweet. Just scoop it and eat it or alternatively we can add it in out sandwiches, salad, smoothies, juices or dishes too. It’s lovely and delicious, I need to have more SunGold kiwifruits in my fridge now. Alright Back to our Zespri SunGold KiwiFest, shall we… Upon arrival I registered myself at the Zespri Check-In booth then I saw some familiar happy faces. I got a booklet that loads with a list of activities to participate and redeem limited edition Zespri SunGold KiwiFest badges. Let’s start the mission! Here comes the main highlight! all her fans including myself were waiting to see Cassey Ho @blogilates , Pop Pilates guru all the way from Los Angeles. I always see her on youtube or her instavideo but seeing her and attending her class live was another thing. 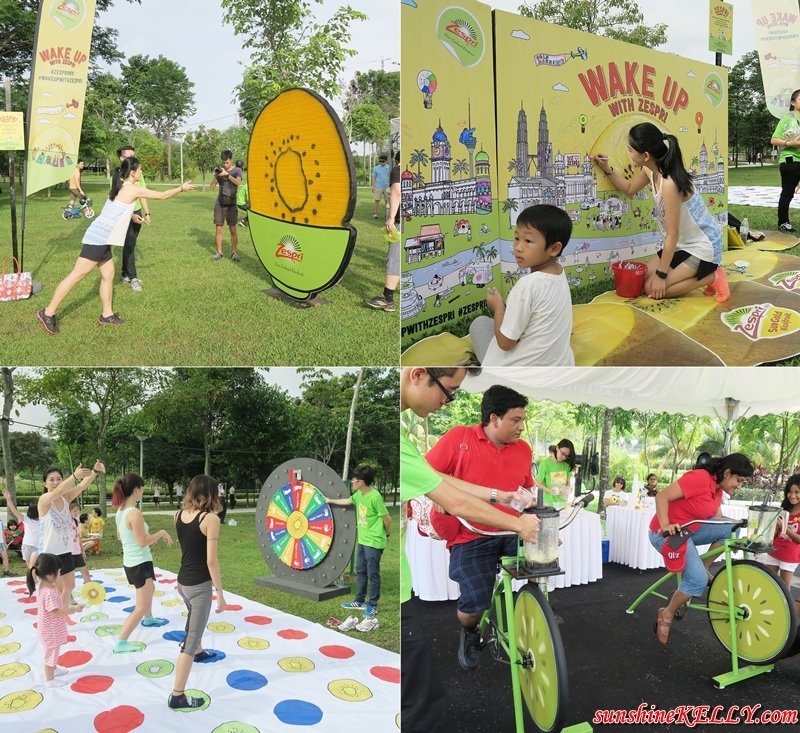 Overall, the first Zespri SunGold KiwiFest in Malaysia was a great! I had lots of fun with friends and also enjoy the healthy juices, workout, games and breakfast with Zespri. Thanks to Zespri for organizing this positive and health inspiring event plus bringing Cassey Ho to Malaysia. You rocks! Hopefully Zespri KiwiFest will be a yearly event. Your post made me curious to visit this place and attend this festival. I was drawing a bunch of fruits awhile ago and one of those fruits was a kiwi. I didn't have a yellow green pen with me so it turned out bad. The event looks fun and I wish I were able to join. First thing in the morning, drinking healthy fruit juice is a must. Kiwi flavor is refreshing too especially incorporating with other flavor of your choice. This kiwifest is great and a must for all to join. Oddly for me, kiwi that gives me a sore throat when I eat it. I discovered this irritation since childhood, and I never liked eating it since. The kiwi fruit is sometimes sweet and sometimes tart. It's quite surprising that one kiwi has more vitamin C than an orange. OMG! Cassey Ho! i always watch her youtube videos!!! i hope she visits my country next! I love kiwi. Love its combination of sweetness, tangyness and juiciness... Looks like one superfun event. I love events that focus on improving our health, especially when it introduces amazing products and food. I'm so curious about that kiwi, it's great that it contains more vitamin c! hope they will have this in near future! the event seems very fun! didn't know that Zespri kiwi contains so high level of vitamin C. must try it out! Suddenly my interest in kiwi has spiked up! thanks dear...where can we buy this ya? I like the bike with a juicer. They seem to have so much fun activities here. I just read about the blogilates (Cassey) on news about the Zespri event. I didn't know that it was held in Malaysia. There's one Global Wellness Day this weekend in Singapore too, not sure if it's related! I've always assumed Cassey Ho was based in the U.S. haha. How lucky are you that you got to try out a workout session with her in person.